I’ve been making injection molds and parts for Ragg’s…To Riches? for a little over a year now. I’m pretty new to all of this, being self-taught. So there’s been lots of trial and error. But I’m slowly getting better and trying more difficult molds. Right now I’m working on a new set of molds for an S-scale gas tank that will fit on the back of a PBL 1934 Ford Pickup. The PBL kit is very close in appearance to the truck shown in the Rio Grande Southern Story, Volume VII on page 123. And I wanted to design a tank that would look much like the one in this photo. It’s very hard to find prototype information about these trucks, so I used some conjecture to create a “close” match. 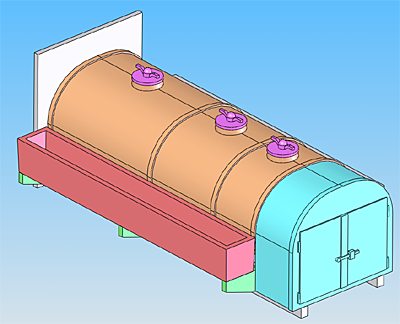 My first step is to use a program called SolidWorks that allows me to build 3-dimensional models, like the one on the right. I like to use a different color for each part to help me remember how everything will fit together when it’s all done. 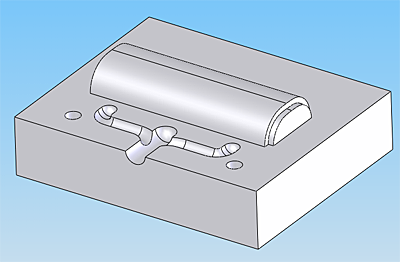 Once I have the model, I then have to design a mold, again in SolidWorks. 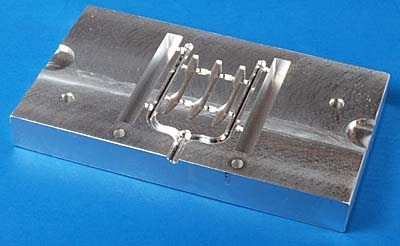 Molds consist of two parts—a core and a cavity. Generally, but not always, the core is the mold half like the one on the right where there is metal projecting out of the mold. The design at the right is a core that I can use for both the top and bottom half of the gas tank itself. Making a mold like this is a little tricky, as you’ll see in the sequence below. I could have started with a thick piece of metal and then cut away all the parts I didn’t need. But that’s a lot of work, so I used another approach—I created an insert, as I’ll describe and show below. Inserts were a technique I’d never tried before. Next I milled a pair of inserts for the core side of the mold. 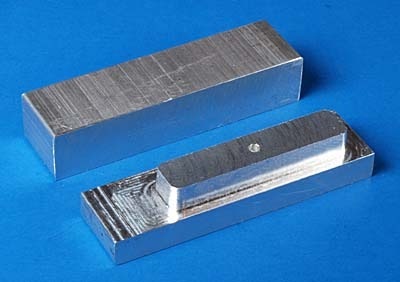 To create the inserts, I needed fairly small blocks of aluminum (these are 0.5 by 0.7 by 2.5 inches) and I had a long 1/2 by 2.5 inch bar. In the past I would have cut this with a hack saw, but that’s not much fun at all. So I broke down and purchased a metal-cutting band saw. Boy, am I glad I did—it makes quick work of cutting the smaller bars, which I then finished off in the milling machine.